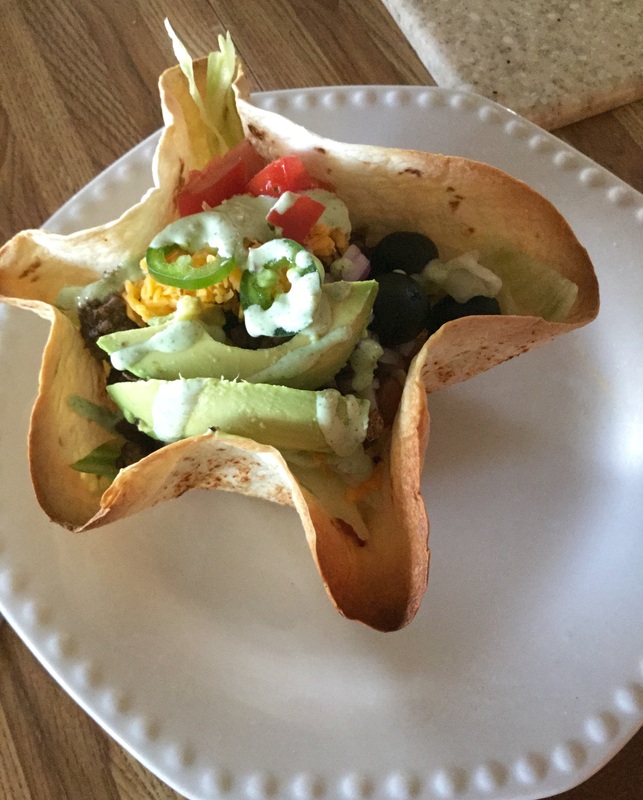 Thinking outside the box of your normal burrito and not wanting to go to a restaurant for a taco salad….I thought I should try making the crunchy taco bowl myself. I also didn’t want to mess with a fryer. I was feeling lazy I guess. This is an easy baked version that will still give you that deep filled, stand up crunchy bowl! Preheat your oven to 400 degrees. Place mason jars (EVERYONE has mason jars these days) upside down on a baking sheet. *you can also use an oven proof mug, small bowl or even a large crumpled ball of foil. Next, I like to put my tortillas in a warmer in the microwave for 30-60 seconds to make them more pliable. Lightly coat each side of the tortilla in a bit of canola oil. If you have the spray, you can do that to each side instead. Drape the tortillas over your jars. *Here is where I’ll go ahead and sprinkle on some chili powder and cumin to the outside of the tortillas. It will stick to the oil and give the shell a nice color and flavor! Bake the tortillas for 8-10 minutes in the preheated oven. Watch closely as not to burn, a few charred edges are good and ‘rustic’ in my eyes ;). You may have to turn the baking sheet for an even color on all of them. Allow to cool for a few minutes and then pull off the jars and fill!! They hold up great! *If you have a while till your filling is ready, pop back in your turned OFF oven to keep warm.